OMAHA, Neb. (KMTV) — On a normal snow day in Omaha, Memorial Park is filled with sledders and snow-lovers. On Friday, a puppy and one family braving the cold weather. 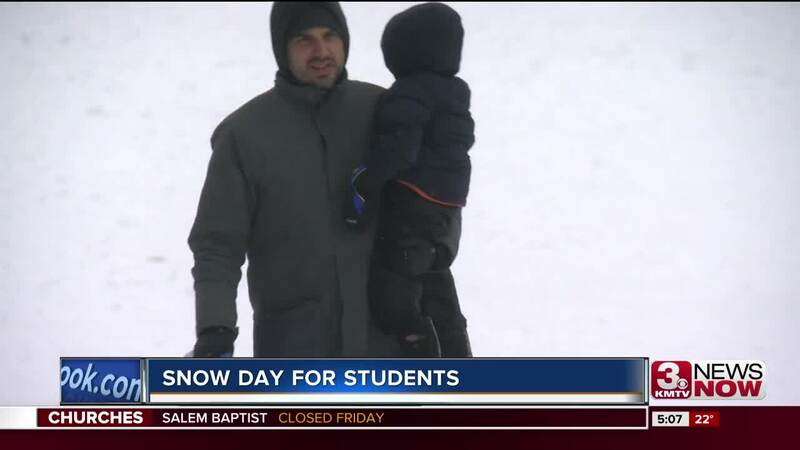 "We're supposed to get a nice amount of snow so people want to stay inside, be warm and enjoy this beautiful snow day," said Ashley Ellington, Unit Director of the Boys and Girls Westside Club. Usually filled with 200 children most school days, 27 spent their Friday at the Boys and Girls Club playing pool, practicing their pattycake, or diving in to their next page turner. "They're excited, they enjoy it, not being in school is always fun," Ellington said. Very few parents decided to let their kids out of the house and brave the snowy conditions, but for those who did, they decided to take their kids to Skyzone Omaha to burn off some energy. "It's a little inconvenient but we make it work," said Cameron Thomas, an Omaha resident and parent of three. "I mean it's part of life around here so you need to roll with it." With the roads freezing over, Thomas thought to take advantage of the small crowds for his rambunctious group of three. "I figured it would keep a few people away," Thomas said. "Makes it easier for the kids to jump around." "I wouldn't be driving in a snowstorm if I were driving," said Ryan McMaster, a junior out Bellevue West who chose to spend his snow day at the trampoline park. "I thought we'd have school today," McMaster said. "First the initial finding out is the best part and then just getting to do whatever you want the whole day without going to school." But no matter what they did, the students were synonymous. Snow days are better than school.